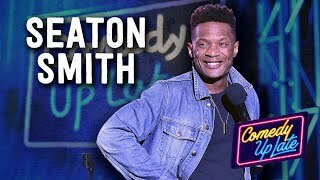 Applying smooth charisma to a layer of explosive energy, topped off with unforgettable characters sure to permanently reside in your brain, Seaton Smith leaves his audience in a state of comedic euphoria as he killed performing on Opie and Anthony Virus tour and the New Faces show at Just For Laughs Comedy Festival in Montreal. He also is a online phenom signing a deal with Sierra Mist where he was able to showcase his chops at producing the skit Pimpin Referee. And he’s a youtube favorite with his popular webseries, Annoy Charlie Smith Inc.